We pride ourselves on offering beautiful printed heirloom products to our clients. Every family has different needs, and I would love to work with you to figure out the best way for you to enjoy and display your portraits. There is no minimum purchase requirement – you can spend as much or as little as you like. Payment of your booking fee will secure your session with Lovely Baby Photography. All prints, products and digital collections are separate from the booking fee. I offer a 100% money back guarantee if you do not like your images. However, if you are like most families, you will fall in love with all of your images. I accept cash, check, credit card and payment plans. Here are some of the most popular ways our clients enjoy their images. We have several options for beautiful wall collections to display in your home. Each set will be designed to fit your wall space within your home. 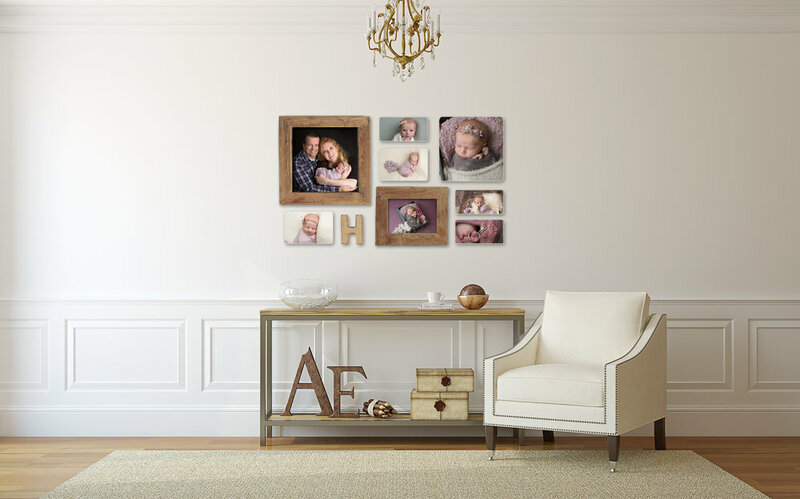 Whether you're looking for one large statement piece or a grouping of your favorite images for the wall, we'll work together to create the perfect presentation for your home. All wall pieces come ready to hang. We are especially proud of our Wall Block Sets, which are made in the Netherlands and shipped to us here in the US. Each order is custom made. Beautifully matted photographic prints are one of the simplest and easiest products our studio offers. They are available in two standard sizes: 5x7 (matted to 8x10) and 8x10 (matted to 11x14). These are photographic prints on fine art Moab Museum Grade paper. They are set into a 4ply matboard, which protects the print from fingerprints and from touching the glass when framed. These come in sets of 5, 10 or 20 and are delivered in a beautiful presentation box that is customized with your baby’s birth information. These are also standard print sizes, and will fit in any frame so it's very easy to bring your prints home and pop them into your current favorite frame. Albums are a great way to enjoy your images when wall space is limited. They are also a beautiful way to keep your images together and ready to hand down from generation to generation. We offer two sizes of albums so you can choose which size is best for you and your family. Albums are priced per image, so you can choose to include just your favorites or all images from your session.